I LOVE teaching science and teaching science through inquiry activities is a game-changer! I've always considered myself a "hands-on" teacher but I've learned that while "hands-on"is a lot of fun for students, they don't always come away with what I intended them to learn. Using inquiry activities in the classroom can excite and engage your students AND they will come away with a deeper understanding of the concept being explored. Planning an inquiry lesson shouldn't take any more time than any other type of lesson. Completing an inquiry lesson usually takes a bit more time than a traditional lesson though. I think the extra time is worth the investment though because my students know understand the concepts AND the vocabulary when they finish. I use the 5E model to frame my inquiry. 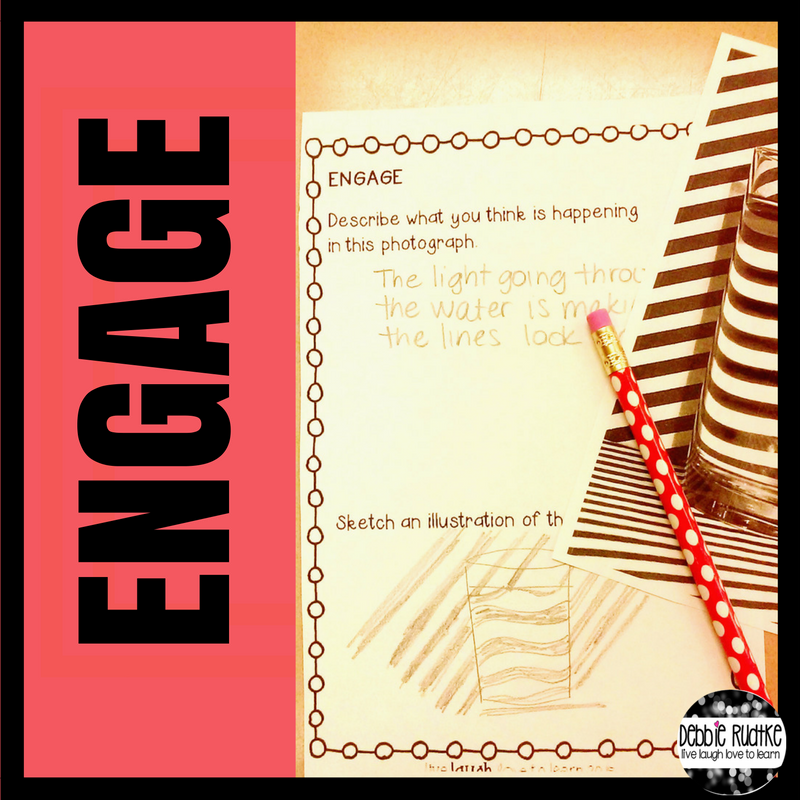 The 5 "E"s are: Engage, Explore, Explain, Elaborate, and Evaluate. The first "E" is Engage. How will you get your students interested in the topic and make connections to prior knowledge? For my Exploring Light Lab Inquiry, I have my students look at an optical illusion photograph. The students discuss what they think is happening in the photo and draw an illustration. I have students share their thinking with the class. I am very careful NOT to explain anything at this point. I just listen and take note of any correct explanations and any misconceptions. I write this information down so that we can come back to it during the "Explain" portion of the lesson. 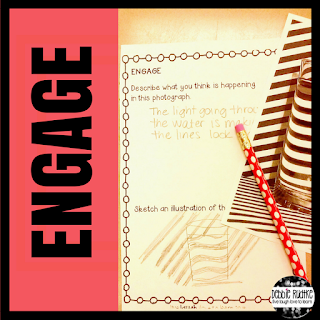 I also think of the "Engage" activity as the "Excite"; the students are hooked and want to explore! The second "E" is Explore. During this phase of the sequence, students explore the concepts on their own. I plan activities that will allow my students to experience the objectives that I want them to learn. 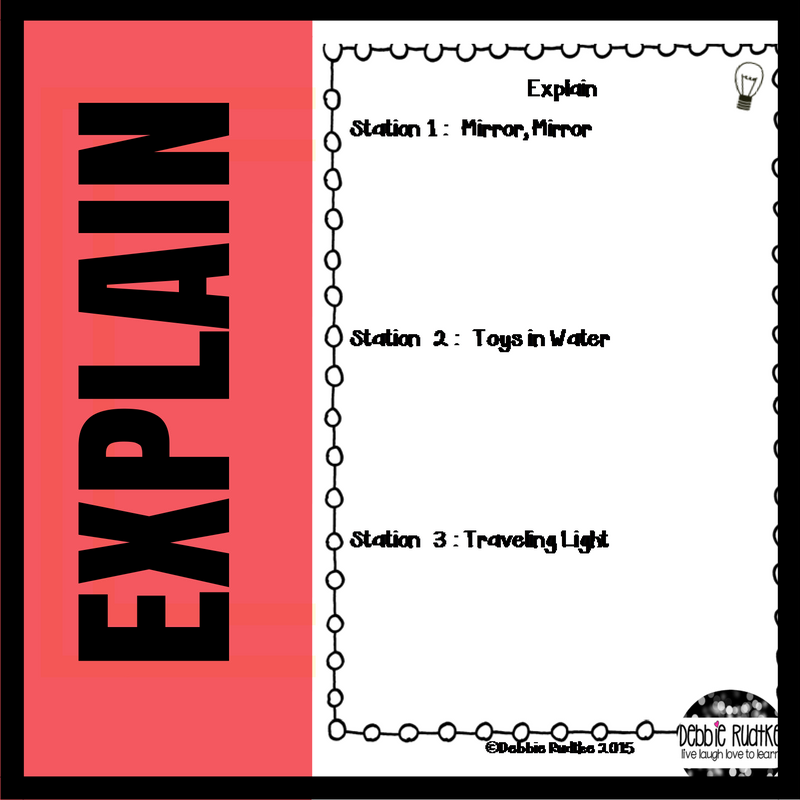 In my Exploring Light Lab Inquiry, I set up 3 stations with materials, directions, and questions to answer. My students will explore and discover that light travels in a straight line, light refracts when it travels through water, and different materials have properties of opaqueness, transparency, and translucency. The students work in small groups to explore and answer questions together. I also allow time for them to explore the materials on their own to test other ideas and questions. Each station lasts about 10 minutes. In my larger class of 24 students, I set up two of each station so that there are no more than 4 students at one station. I want to ensure that each student has ample opportunity to have a hands-on experience. The third phase is of the sequence is "Explain". During this phase, the teacher guides a discussion of the activities and allows the students to give the explanation of the concepts in the objective. If students do not come up with the vocabulary word necessary to describe what is happening, the teacher provides it. At this point, I review the discussion from the "Engage" phase. I make sure that we discuss the correct explanations and address any misconceptions that were brought up. This part of the sequence is critical for students to understand the concepts explored. As a teacher, I am facilitating a discussion (usually a lively one!) that allows students to take ownership of the learning of the concepts. I have my students take notes on the concepts and the new vocabulary during this part of the lesson sequence. The fourth phase of the 5E sequence is "Elaborate". At this point, students have an opportunity to apply and connect their new learning to previous learning or to similar concepts. During this phase, the goal is to have students use the new concepts and vocabulary learned to other similar situations. For example, in my Exploring Light Lab Inquiry, I show my students a photograph of a highway on a hot day that "appears" to have a puddle of water. 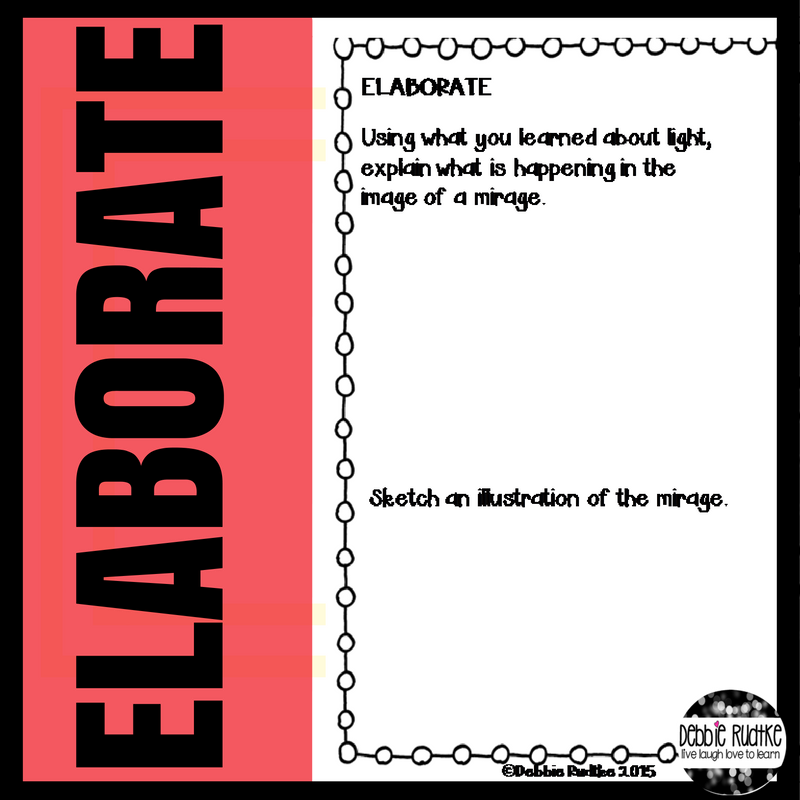 Students work together to come up with an explanation of what is happening that creates the mirage. My goal is for students to come up with refraction as an explanation for the mirage. Here, I can extend their learning and discuss convection and refractive indexes. This allows an opportunity for a deeper understanding of the concept and a chance to ask questions for further exploration in the future. I require students to write down at least two questions they would like to explore further. 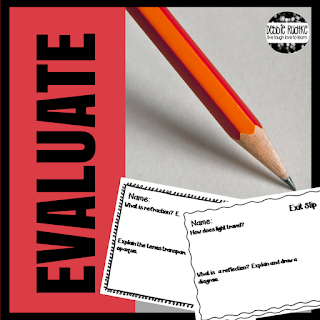 The fifth and final part of the 5E sequence is "Evaluate". At this point, it is time to assess your students understanding of the concepts. I use and exit slip so that I can collect and document their responses. I sort my exit slips into three groups according to mastery: complete, partial, and very little. 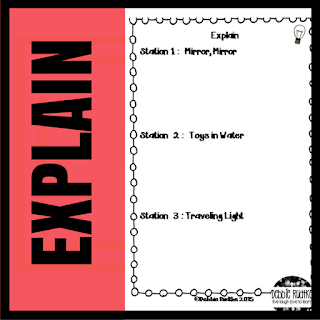 I use this information to place students in small groups to review or extend the concept. I will work with the groups who were not completely successful. 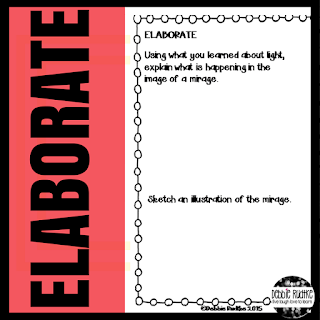 The students who mastered the concept will have an opportunity to work on an extension activity based on a question they came up with during the elaboration phase. These students can either work together or independently to research their question and record their findings in their science notebook. The 5E Instructional Model is an effective way to enhance students' understanding of scientific concepts while developing scientific process skills. 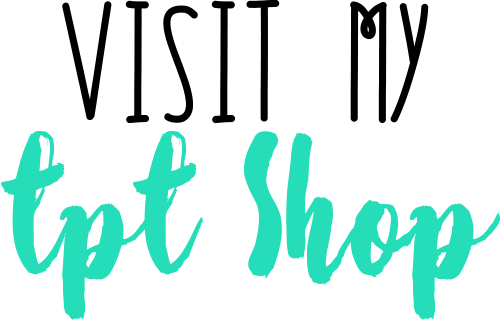 Students take ownership of their learning and have the opportunity to explore with hands-on activities that allow the students to discover and explain concepts in their own words. Please note that the sequence does not have to be linear. If students do not understand the concepts, you may let them go back and explore! 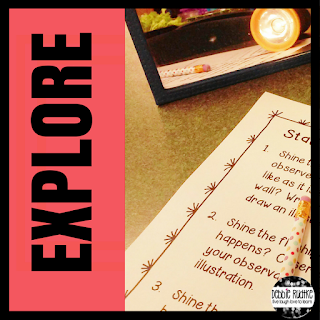 If you are interested to try an inquiry lab in your classroom, check out my Exploring Light Lab in my Teachers Pay Teachers store. 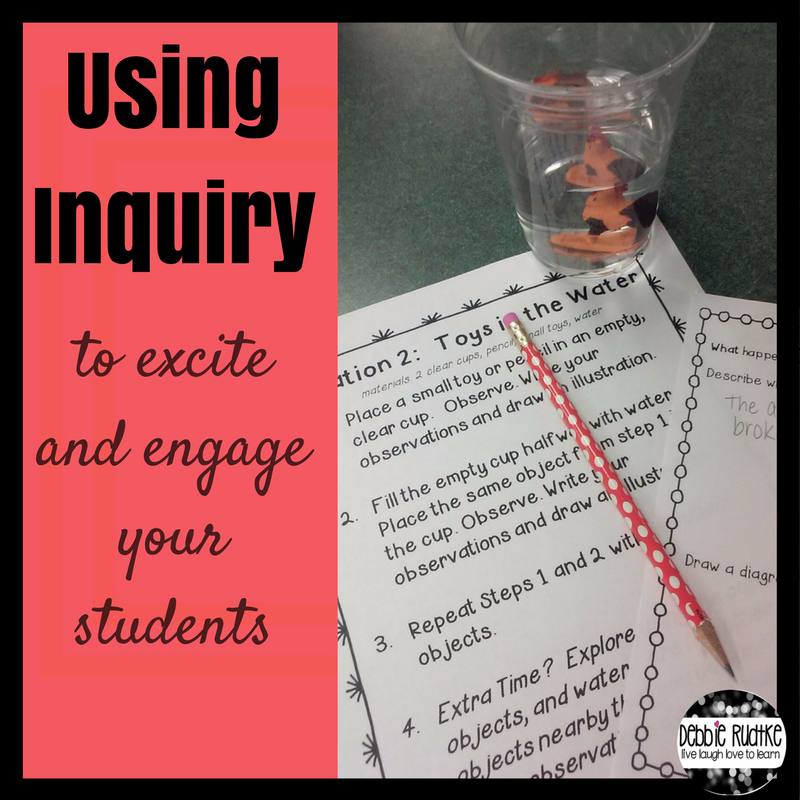 Thanks for taking the time to read about how I use inquiry in my classroom! Live, laugh, love to learn!